Just before 3AM, four days past my due date, I woke up to my first contractions. I hadn't felt anything significant up until then (aside from many braxton hicks contractions for a couple months), so my thoughts went immediately to, Oh, my gosh. I think this is it. Eisley was born five days before her due date, so the fact that I had actually reached 40 weeks (and several days) seemed like very unfamiliar territory. Although I knew there was no guarantee I'd have this baby early, going past my due date hadn't even seemed like an option this time around. At my most recent OB appointment we had gone over all the "just in case" scenarios—which had me just a bit stressed out. Just in case you hit 41 weeks, we'd like to schedule an induction at that time. You can go to 42 weeks if you prefer, but we usually recommend an induction during the 41st week. I remember sitting there thinking about how weird it was to be experiencing this side of pregnancy. Because Eisley came early, I didn't even have time to think about being induced, or dread the thought of going two weeks overdue and possibly giving birth to a 10 lb. baby. 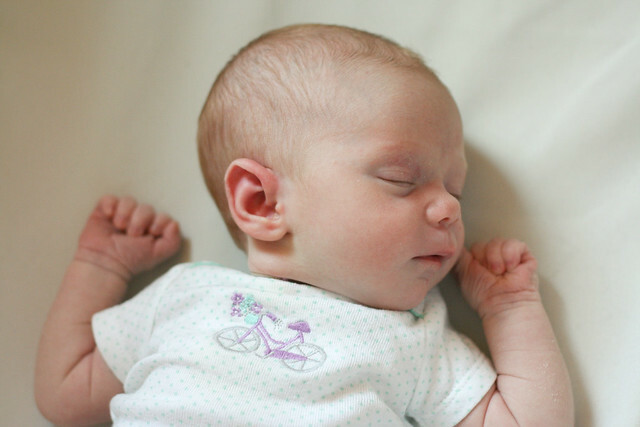 (Although Eisley was small, I discovered that my husband was two weeks late and 9 lbs. when he was born, so learning that may have stressed me out ever so slightly.) With Eisley, I had assumed I would go past my due date but didn't do much thinking about anything that would actually involve. When I did go into labor with her, I was so unprepared and hadn't even washed any of the baby clothes or fully packed my hospital bag. Somewhat perfectly, the morning I went into labor with Cora was the morning I had previously scheduled my first holy-moly-you're-past-your-due-date appointment with my doctor. (It was one appointment I was rather happy to miss, to tell you the truth.) As I kept track of my contractions, unable to sleep despite the ridiculously early hour, all I could think about was how grateful I was that my body had gone into labor by itself after all. I ended up waking Jay around 4AM just because I was tired of keeping the secret and I was wondering when I should ring the alarm (so to speak). I let him know I was in labor, but it wasn't time to go just yet. My aunt was "on call" to come and stay with Eisley when we headed to the hospital, so I was trying to figure out when exactly to call her—hoping things would continue to progress slow enough that I wouldn't have to call her before sunrise. We left just after waking Eisley and giving her breakfast. That is something I'm so grateful for…to have had a bit of time to explain everything to her and to give her extra hugs and kisses and a special Cinderella doll I'd chosen as a big sister gift for her months before. Around 7:30, my cousins showed up to watch her (in lieu of my aunt for a short while) and off Jay and I went to the hospital! I felt so much more prepared this time around, it was almost silly. We had everything we needed for the baby, we were actually preregistered at the hospital, I had a bag perfectly packed, and there was really very little anxiety over the whole thing. The drive there was so normal and peaceful…despite contractions that were still coming along around every four minutes. When we arrived at labor and delivery, we smiled at the lady working the front desk and said we needed to check in. She gave me what I could only assume were angry eyes of judgement and said in an annoyed voice, "Are you in labor?" I was all, "Eh…yes?" And she gave me some paperwork to sign, telling me they'd call me when they were ready. Yes, she was quite the delight that early in the morning as my uterus was going on a wild rampage within my body. Thank you, ma'am. Anyhow, front desk personality aside, we were taken to triage just before 9AM. At which point I was told I was only dilated 1 cm. nurse: "You're only at 1 cm." me: "HOW? My contractions are so close together already and they're getting pretty painful and I'm not sure how this is humanly possible and maybe you should check again?" Long story short, I had high blood pressure (just like last time around!) and although my contractions were consistent and rather intense, I wasn't dilating at the rate I "should" be. They ran a ton of tests because of the high blood pressure (they all came back fine and said this time it was probably just because of the pain), ran a bunch of other tests to make sure the baby was okay (they mostly came back fine until the nurse said she didn't like how the baby wasn't moving much on the ultrasound), and after a solid three hours told me they had no rooms available so I'd have to come back at 7PM to be induced. I'M SORRY. WHAT'S THAT NOW? At that point, my contractions were very painful. Not to the point of screaming for an epidural (more on that later) but I knew there was no way on God's green earth that I'd be able to go home in that much pain and just hang out all casually the entire day, only to come back that evening to be induced. I was actually really confused. Even thinking about it now makes me a bit annoyed, because I'm not sure how sending me home made sense to anyone. I had already told the nurse that once I was in active labor for my first birth, it went very quickly, but I don't think anyone tends to believe a woman who is only dilated (at that point) 2 cm. Thankfully, after a bunch of phone calls and more discussion, the nurse did end up agreeing to admit me. (I wanted to scream hallelujah but managed to somehow reign in my relief and elation.) And sometime around 1 or 2PM I was finally in a room, settling in and feeling grateful to finally be so close to meeting my second baby girl. Oh, I hope we don't have to wait too long for part 2!